This article is about computational science applied in physics. For theories comparing the universe to a computer, see digital physics. For the study of the fundamental physical limits of computers, see physics of computation. 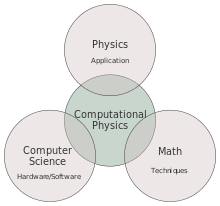 A representation of the multidisciplinary nature of computational physics both as an overlap of physics, applied mathematics, and computer science and as a bridge among them. There is a debate about the status of computation within the scientific method. Sometimes it is regarded as more akin to theoretical physics; some others regard computer simulation as "computer experiments", yet still others consider it an intermediate or different branch between theoretical and experimental physics, a third way that supplements theory and experiment. While computers can be used in experiments for the measurement and recording (and storage) of data, this clearly does not constitute a computational approach. Physics problems are in general very difficult to solve exactly. This is due to several (mathematical) reasons: lack of algebraic and/or analytic solubility, complexity, and chaos. For example, - even apparently simple problems, such as calculating the wavefunction of an electron orbiting an atom in a strong electric field (Stark effect), may require great effort to formulate a practical algorithm (if one can be found); other cruder or brute-force techniques, such as graphical methods or root finding, may be required. On the more advanced side, mathematical perturbation theory is also sometimes used (a working is shown for this particular example here). In addition, the computational cost and computational complexity for many-body problems (and their classical counterparts) tend to grow quickly. A macroscopic system typically has a size of the order of constituent particles, so it is somewhat of a problem. Solving quantum mechanical problems is generally of exponential order in the size of the system and for classical N-body it is of order N-squared. Finally, many physical systems are inherently nonlinear at best, and at worst chaotic: this means it can be difficult to ensure any numerical errors do not grow to the point of rendering the 'solution' useless. All these methods (and several others) are used to calculate physical properties of the modeled systems. Computational physics also borrows a number of ideas from computational chemistry - for example, the density functional theory used by computational solid state physicists to calculate properties of solids is basically the same as that used by chemists to calculate the properties of molecules. 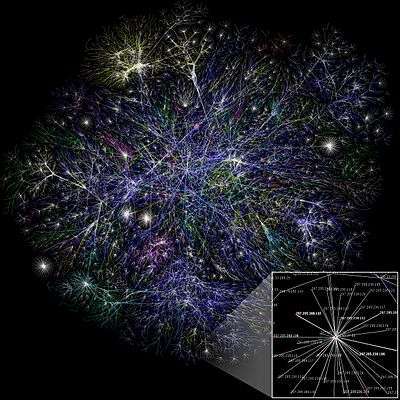 Furthermore, computational physics encompasses the tuning of the software/hardware structure to solve the problems (as the problems usually can be very large, in processing power need or in memory requests). It is possible to find a corresponding computational branch for every major field in physics, for example computational mechanics and computational electrodynamics. Computational mechanics consists of computational fluid dynamics (CFD), computational solid mechanics and computational contact mechanics. One subfield at the confluence between CFD and electromagnetic modelling is computational magnetohydrodynamics. The quantum many-body problem leads naturally to the large and rapidly growing field of computational chemistry. Computational solid state physics is a very important division of computational physics dealing directly with material science. A field related to computational condensed matter is computational statistical mechanics, which deals with the simulation of models and theories (such as percolation and spin models) that are difficult to solve otherwise. Computational statistical physics makes heavy use of Monte Carlo-like methods. More broadly, (particularly through the use of agent based modeling and cellular automata) it also concerns itself with (and finds application in, through the use of its techniques) in the social sciences, network theory, and mathematical models for the propagation of disease (most notably, the SIR Model) and the spread of forest fires. On the more esoteric side, numerical relativity is a (relatively) new field interested in finding numeric solutions to the field equations of general (and special) relativity, and computational particle physics deals with problems motivated by particle physics. Computational astrophysics is the application of these techniques and methods to astrophysical problems and phenomena. Due to the broad class of problems computational physics deals, it is an essential component of modern research in different areas of physics, namely: accelerator physics, astrophysics, fluid mechanics (computational fluid dynamics), lattice field theory/lattice gauge theory (especially lattice quantum chromodynamics), plasma physics (see plasma modeling), simulating physical systems (using e.g. molecular dynamics), protein structure prediction, weather prediction, solid state physics, soft condensed matter physics, hypervelocity impact physics etc. Computational solid state physics, for example, uses density functional theory to calculate properties of solids, a method similar to that used by chemists to study molecules. Other quantities of interest in solid state physics, such as the electronic band structure, magnetic properties and charge densities can be calculated by this and several methods, including the Luttinger-Kohn/k.p method and ab-initio methods. 1 2 Thijssen, Joseph (2007). Computational Physics. Cambridge University Press. ISBN 0521833469. 1 2 A molecular dynamics primer, Furio Ercolessi, University of Udine, Italy. Article PDF. ↑ "How Long Do Numerical Chaotic Solutions Remain Valid?". Bibcode:1997PhRvL..79...59S. doi:10.1103/PhysRevLett.79.59.